After going through a long summer pumping cool air through your home, your central air conditioning unit is finally enjoying a much-needed rest during winter. There are some essential steps that you should take to protect your AC unit during winter so that it will be ready to serve you better when the temperatures start to rise again. Typically, the air conditioning system has been built to survive in tough weather, and some homeowners say that their AC units still work fine even when they fail to implement any protective measures during winter. However, the outdoor unit may be damaged by debris, repeated freeze-and-thaw cycles, and moisture buildup if you fail to perform any protective action during winter. Most homeowners have been wondering whether it’s good to cover the air conditioning unit during winter. In fact, this has been a heated debate in the heating and cooling industry for long. Nonetheless, there are several advantages to covering your unit. It may not be necessary to cover your AC unit if you live in areas that don’t experience hailstorms, but if you live in the north, it might be worthwhile if you consider covering it in winter. For instance, it’s not strange to encounter hail in the Midwest. Although it’s difficult to know when a massive storm is coming, covering your AC units acts as a proactive measure that safeguards it against potential destruction. Dripping water from gutters and trees can also get into the system. The water turns into ice when temperatures drop which can damage the fins. Covering your AC units helps in keeping your air conditioner coils a little cleaner since external dirt is kept at bay. This will help it to run a little more efficiently when it’s time to use it again in the summer. An air conditioner cover also makes the AC unit look better in the long run. One of the most sensitive parts of your AC unit is the fins of your outdoor air conditioner’s condenser coils. Flying leaves and debris can cause severe problems to your unit. The coils won’t be able to release cold air to cool your home when the temperatures begin to rise in summer. Apart from covering your unit, you should also consider cleaning the coils before the hot season begins. Sometimes, falling ice can also hit the unit with a lot of force causing severe damage to the delicate coil fins. If you know that you’re living in an area prone to snowstorms, then covering your air conditioner unit can help a big deal. If snow accumulates inside your unit, then melting and refreezing it will automatically damage the coils. Make sure that you cover your AC unit just before a blizzard and uncover it after. You should also spare some time and clear the snow around the outside unit. Are you looking for a heating and air conditioning expert in Southern California? 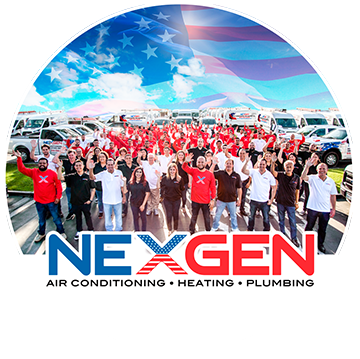 Contact Nexgen Air today for quality heating and cooling services. ← Can Proper Insulation Save You Money?